We all piled into my pickup truck to retrieve the three 12-foot long rolled banners. They were six feet longer than the truck's bed (and about as long as the entire truck), so we perched them diagonally atop the cab, and the operatives riding in back kept them under control. We drove to the site. Scaling the summit of Macey Center would be a multi-step procedure. We used Spook's keys to get into the basement music room. But a locked door blocked access to the main auditorium or the roof. Fortunately, the accessible and inaccessible areas of the building had adjacent balconies, one over the other. Ratchet and Climber would scale the outside of the building to the upper balcony and enter through its door, which we had unlocked earlier in the day. From there, the two would open the inside door connecting the two areas, let us all inside and up the stairs. From there, we would get to the catwalk in the ceiling of the main auditorium above the sound-baffling clouds, and from there climb the ladder that leads through a trap door onto the roof. Standing on the lower balcony, Ratchet readied his grappling hook for his ascent up 16 feet of stucco to the upper balcony. Ratchet swung his arm, and threw the grappling hook high into the air. On Batman and Mission: Impossible, there is always a convenient railing or pipe on which a grappling hook can grab hold, and it always does on the first toss. Unfortunately, there was no television crew to ensure our success, and the hook promptly crashed onto the concrete balcony next to Ratchet. Undaunted, he reclaimed the hook, recoiled the rope in his other arm, and with greater verve heaved the grappling hook back up into the darkness. It did not crash into the ground. The line played out and seemed to stop, suspended in air like the old Indian rope trick. Suspiciously, there was no reassuring sound of the sharp metal hook impacting something overhead. Ratchet was unsure, so he violated the first rule of grappling hook use and looked up, just as the airborne hook fell onto his face. Meanwhile, Operative Mom (Leann Giebler) was freed from her job at the library and joined the mission. I turned the truck, radio, and constabulary lookout duty over to her, and headed for Macey to join the heart of the operation. Ratchet opened the outside door to let me into the building, and I saw his face covered with flowing blood. My heart sank; "This," I thought, "is just the sort of catastrophe that prevents most people from engaging in this sort of activity." But Ratchet contradicted me. "Just a small facial wound--the blood in my eye is a lot more annoying than the wound itself. I'll go to your dorm room, clean up, and be back as soon as I can." I climbed the stairs, entered the clouds, and saw that getting the 12-foot rolled banners from the narrow catwalk, up the ladder, through the trap door, and onto the roof was an unforeseen challenge. With one person on the roof, one person at the base of the ladder, one on the ladder, and one on the catwalk for support, we managed to slowly guide each banner up and out the hatch. Finally, we had all the equipment in the right place. The roof had a 3-foot-high ledge running all around, which gave us cover when we needed to hide and helped prevent Operatives plummeting to the ground. However, while standing we were visible over the ledge from several points on campus. Fortunately, Mom was a diligent lookout, and reported whenever the police approached. One rooftop operative was also a lookout. During the night, lookouts sounded the alarm several times and we quietly crouched down to ensure that we remained unapprehended. The ledge ran along only three of the four roof edges. The tops of the solar panels approached an 8-foot wall on the fourth edge. We filched four folding chairs inside the building, which we used as stepstools for attaching the banners. The roof at the top of the solar panels had an edge of aluminum flashing along its entire length; as far as the hooks were concerned, this edge was their curtain rod. We had attached the curtain hooks along the top edges of the banners, and clipped the hooks onto the aluminum. This part of the operation required greater care than we had anticipated, as we had not foreseen the difficulty in holding heavy banners onto the solar panels while attaching the hooks--if we dropped a banner, it would slide sixty feet down the solar panels, enter freefall and crash into the concrete slab at the base of the building, which would be bad. We were working above our heads, illuminated only by our flashlights. With great persistence and much duct tape, we successfully attached the banners to the building. Finally, about the time Ratchet returned from washing his face, we had all three banners hooked and taped to the building, ready to be unrolled. This was the point of no return. Up to this point, everything we had done was fairly inconspicuous from the ground--merely some whispering people walking around on the high roof. But the moment we began to unroll the banners, they would be dramatically conspicuous, and the time we'd have to escape was directly correlated with our ability to coordinate with the lookouts. We waited for fifteen minutes before Mom reported that the police were at the most remote corner of campus. It was time to deploy. We had rolled the banners with clothesline so we could use the line like strings on a window shade to unroll the banners down the solar panels. This was not as simple as merely belaying the line--it was surprisingly difficult to perch on folding chairs in the dark, peer down the steep solar panels, and let out the string over our heads while avoiding tangling or twisting. The S and M banners went down without difficulty. 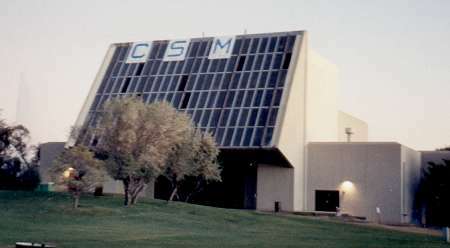 But the left side of the C banner caught on a broken solar panel about 10 feet down the side of the building. It was well out of reach, and we had not brought climbing equipment. Raising and lowering the banner did not help--it kept getting stuck at the same spot. We were two-thirds deployed, extremely conspicuous, and this problem threatened to turn our "Colorado School of Mines" prank into a bit of "School of Mines" nostalgia. Climber came to the rescue. In the most death-defying feat ever performed by a Beta operative, he climbed over the edge at the top of the building. Fingers held onto his feet while Climber yanked and pushed on the banner's wooden strips to get them free from the snag. If Fingers had let go, Climber would slide head-first sixty feet down the solar panels, enter freefall and crash into the concrete slab at the base of the building, which would be very bad. But in two extraordinarily tense minutes, Climber straightened the banner, and Ratchet pulled him back up onto the roof. Moments later, Mom radioed from the truck "Deployment successful. What a sight!" All the banners were in place, obvious to anyone driving or walking nearby. The final phase of the mission had begun--our rapid exit. That first photo after the banners were up. You can see the black space under the C on which that banner repeatedly snagged until Operative Climber's heroic effort. We raced down the ladder, bringing all our equipment, and closed the trap door. The trap door had a hasp to allow authorities to restrict roof access. We attached our own padlock to hinder those who might undo our handiwork. We dashed along the catwalk, down the back stairs and out into the fresh air, locking the door behind us. As we ran across the grassy lawn, we turned back to see our success. Even in the dark of night our banners were a glorious sight. With far too much adrenaline to sleep, most of us went to Denny's to celebrate. Before long, daylight crept over the horizon. I returned to Macey Center and photographed our handiwork. Back at my dorm room, I was elated to see the banners prominently visible all the way across campus. I fell asleep the moment I was in bed. Waking up hours later, I called (and awakened) Fingers. We ventured to Macey Center's 49ers festivity. The banners were still up, in view of all festival-goers, and as we passed by the merrymakers, we heard several discussions about the Colorado School of Mines. Heavy winds were blowing, but our curtain hooks, furring strips, duct tape reinforcement, and vent holes were doing their job--the banners fell back down into place each time they were blown into the air. Thanks to our strategic padlock, no one could get onto the roof for several hours. They had to find bolt cutters while the entire campus was shut down, and then perch atop the access ladder above the catwalk to use them. A student named Schlake and Macey employee Dave Thurston led the first group of people onto the roof. They hoisted the "C" banner and used fluorescent orange paint to paint "NM" over it, and lowered it again, where it remained for several more hours. In late afternoon, the winds finally caused the banners to start disintegrating, but they had lived a marvelous life. Our banners were the talk of campus. 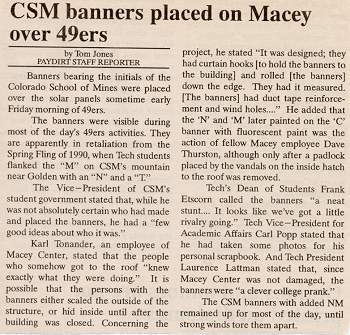 Operative Spook idly engaged his advisor and a fellow student in speculative conversation about how the banners had been hung, and the other two seemed convinced that the Colorado School of Mines students were prolific climbers and had scaled the entire building carrying the banners. I had the delightful opportunity to conduct official inquiries. As Paydirt Editor Emeritus, I wrote an article about this activity perpetrated by "unidentified vandals." I interviewed the Dean of Students (who called it "a neat stunt"), the Academic Vice President (who said he had taken some photos for his personal scrapbook), and the college president (who, after hearing that no property was damaged, said it was "a clever college prank"). I also interviewed Karl Tonander, who aside from being an employee of Macey Center was my friend and the extremely competent leader of the student government Finance Committee. On the record, Karl stated, "It was designed; they had curtain hooks and rolled [the banners] down the edge. They had it measured. [The banners] had duct tape reinforcement and wind holes," showing his respect for our engineering. Socorro's town newspaper, the Defensor-Chieftain ran a front-page photo of the banners. As president of our student government, I called the president of the CSM student government, and congratulated him on having gotten us, and vowed revenge. He said that he had a few good ideas about who might have done it, and asked for a photo for their school newspaper. I will forever be disappointed that among all the CSM students, none stepped forward to claim credit for our deed. The secret remained among the Beta operatives and our select few confidants; whenever I engaged friends in speculative conversation about the project, none surmised that Tech students could be responsible. I did let a certain Vice-President of the institute know that I had been involved in the project, and that nobody from CSM was involved. This was when he told me that, if we ever got into trouble with law-enforcement authorities, from campus police to the town sheriff to the MPs guarding the mountain, we should contact him to minimize our legal difficulties, an offer that proved helpful in recruiting new members. Operation Public Hanging was the proudest Stealth Force Beta mission, and also the one we could discuss the least. In recognition of Ratchet's facial injury, he was awarded the Purple Toe medal, for bloodloss suffered in the line of duty. In hindsight, Climber should have received a medal for the dramatic courage to hang suspended over the edge to straighten the "C" banner. This was Stealth Force Beta's brightest hour. 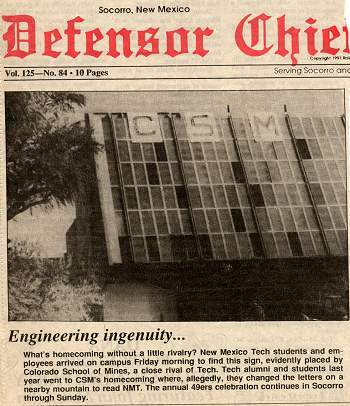 Stealth Force Beta Operation Public Hanging leads the news, from the top of the front page of the Socorro Defensor Chieftian on October 19, 1991, and from the top of the front page of the student newspaper Paydirt on November 11.